The brain needs exercise just like any other part of the body. Neglecting to put your gray matter through mental hurdles now and then will leave it weak and vulnerable to early onset Alzheimer’s and other forms of dementia. The short of it is this: everyone needs a hobby or two in their lives. More importantly, everyone needs something to keep their brains challenged. The challenge for most working class folks, apart from finding the time, is finding something to do that doesn’t take a bite out of the monthly budget. It may be called the Game of Kings but we all know the Queen runs the show. It’s never too late to learn what is undoubtedly the most popular board game in human history. Rules of chess are surprisingly easy to grasp yet the possibilities are practically endless as far as how each round will turn out. Play against both computers and people. Don’t think chess clubs are for kids and geeks alone – most cities and towns have a variety of clubs that welcome people of all ages and skill levels. Dues, if applicable at all, are usually waived if you volunteer your time for helping with competitions and other events. Similar to dusting off that chess set grandma gave you for Christmas 1987, finally trying to put that acoustic guitar you begged for as a teenager to good use is also good for your brain. Finding guitar lessons for beginners, or lessons for whatever instrument you may have in storage, is not as expensive as you may assume. Services provide user ratings of local musical instructors along with price quotes for finding lessons that fit your budget. Thanks to your local library reading will always be free if you return your books on time and forget about which part of your taxes went to pay for keeping the doors open. Reading books as opposed to shorter, less complex pieces of writing has been proven to do wonders for improving and fortifying mental agility. Not to say blogs like this one don’t have a place in the habits of healthy readers, but committing your brain to hundreds of pages of writing devoted to one central story or theme means developing an abstract framework for days and weeks instead of minutes and hours. Bottom line, this means you walk away with an improved ability to connect real world events with abstract ideas – the trait that makes humans human. The quality of cameras which come standard with today’s iPhones and leading Android devices are absolutely amazing. Becoming an amateur art photographer has never been easier or more popular, as Instagram and other photo-centric social media services show. With that said, subject is key and the world is waiting for you to make a record of its countless wonders. Learning how to find desirable subjects, whether they be people, places, or things, and framing them for the sake of creating an accomplished image takes great skill. In other words, it requires the sorts of brain focus which count as mental exercise. All the while you’re having fun and not spending a dime unless you run out of phone storage space. Social interactions are considered central to reducing your chances of developing dementia later in your life. Getting involved with causes and organizations aligned with your beliefs and priorities can not only provide a sense of fulfillment in the form of activity but help make you a better thinker in the long run. Not to mention being a volunteer typically doesn’t involve spending more than your time. 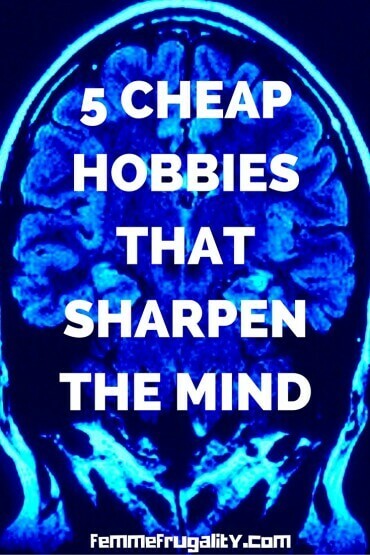 Hobbies come in all forms and range in price from free to more money than we care to mention. Folks on a budget need something to do like anyone else. Likewise we have a responsibility to our brains – the seat of everything that makes us who we are – to maintain their fitness for the duration of our time here on Earth. Combine the two in the form of a cost effective interest like the ones mentioned above. It’s not only something to do, but something to think about. Snugg iPhone Cases: Worth the money? This entry was posted in Ways to Save Money on October 14, 2015 by femmefrugality. My mom always sends me sudoku puzzles and the time it took to solve them. She’s now much better than I am. My mom loves Soduku too! Great list of budget-friendly brain games! Another fun (and free) activity is learning a new language through duolingo! True! I heart multilingualism. Our library gives us Mango for free. Will have to check out Duolingo. Lol I joined the chess club in third grade. That doesn’t mean I’m great… My record is probably 50/50. And teachers do read a lot! Kudos for the piano, too. I need to pick that up more seriously again. Another cheap/free hobby is learning a new language. I learned Spanish using Duolingo. There are plenty of free programs available to teach you the basics of learning a language (the tl;dr version is learn the 1,000 most commonly used words and the transitive verbs such as is, to be, etc.). Our public library has a meetup for people learning Spanish. Basic vocab, conjugation rules, and declinations should do it! Ironically enough, I think the languages that have the most solid rules with the fewest exceptions are often viewed as the hardest fit native English speakers to learn, as we tend to be on the opposite side of the spectrum. Our library has Mango for free, but do many are pushing Duolingo. I’ll have to check it out. Because even if creativity was all you got out of it it would be well worth it. And there’s definitely a lot more, like you said. I agree with Jason that learning another language is a great way to keep the mind sharp, Plenty of free or low cost ways you can do that. I took up ukulele just over a year ago. It keeps you challenged that’s for sure. Consensus reached on the foreign language learning! And ukulele… How cool!! I agree that learning another language is one of the best ways to keep mind sharp. I believe there are scientific studies that back up that claim. I read once that learning something new is much better for the mind that doing something complex that you know well. So while chess and crosswords can keep your mind active, it’s actually more engaging to learn something new and step outside your comfort zone. I’m pretty sure that’s true. I’ll have to look it up. I know that if at first you don’t succeed, trying until you find a solution builds new neural pathways. So the struggle is part of it! Great list -some of these I do and some I would like to. The flute is still in the closet-once a year I make sure I play it. It’s amazing how it all just comes back to me. Maybe I should get it out more. I would love to volunteer. I just have to get out there and do it. Maybe soon. That’s awesome that it comes back to you like that! I used to be halfway decent at piano, but the skill has faded. I probably just need to put more time into it. Best of luck with the volunteering thing! I know you already do a lot of service within your family, but if you’re itching for more it looks like it can definitely help! Love this list. I used to play an instrument or take on crafty projects, but nowadays I like to bake every now and then if that can be considered a hobby. It seems like all I do is work these days so I need to find an official hobby that allows me to unwind. I hear you on that one. I’m the same way. Ironically enough, around the busiest time of year, the holidays, I tend to bust out my old novice craftiness and put my hands back into music. I have no idea how it gets pulled off. My sleep may suffer that time of year haha. There are also a ton of free courses online. I just signed up to take a free course on Quantum Mechanics that I’m hoping is pretty cool. Great list of ideas! I have always wanted to play an instrument and am in awe at people who can! I also used to volunteer a lot when I could – would like to pick it back up! Good list. My husband has been teaching our 5 year old chess, and it’s great to see her get a grasp on the game (and why it’s okay not to win every time.) We read like crazy. It’s so great that our local library has e-books, so we don’t even have to make a trip to find new reading material. One hobby I find myself going to lately is drawing, in part because of my daughter’s enthusiasm for art. Now you can spend a ton of money on art supplies, but you don’t have to. Some decent pencils and a good pad of paper don’t set you back that much, and drawing can train you to pay attention to detail (even if like me, you aren’t that great at it.) I think that’s why adult coloring has gotten so popular. Does air guitar count? Probably not, but I do enjoy reading, especially about history, and Jeopardy! is a must watch in our house. I also like the idea of learning a new language. I’ve taken some Spanish lessons offered by our township, and I’ve been considering learning some Hindi phrases with my wife so we can better communicate with some of our neighbors. I’ll have to check out Duolingo since it has so many recommendations. I really love to read, but for some strange reasons, I never find enough time in the day to read as I would really love to. Volunteering is something I have been meaning to do more of. This has given the motivation to go ahead and take action however small. This article goes to show that the best things in life are FREE indeed. I never tried chess or maybe once but I didn’t understood nothing about it, but I am sure it helps brain also the point 2.3.4.5 and volounteer helps brain, heart and sould all together!!! Reading and volunteering are my two favorites on this list! The library is amazing and free and volunteering is such a great way to stay connected to your community and give back!